The author, a middle-aged man and father, goes on a mission to find the vinyl albums he owned growing up (the actual ‎copy that he could identify by a skip in the record, something written on the cover, etc.). Spitznagel tries to initially present himself as something of a music snob, but it's revealed that he has a weakness for some mainstream music as well. This book delves into nostalgia, art, fatherhood, and what's missed when music isn't tactile in a smart, self-deprecating and sometime emotional way. High Fidelity meets Killing Yourself to Live when one man searches for his lost record collection. As he finds himself within spitting distance of middle-age, journalist Eric Spitznagel feels acutely the loss of… something. Freedom? Maybe. Coolness? Could be. The records he sold in a financial pinch? Definitely. To find out for sure, he sets out on a quest to find the original vinyl artifacts from his past. Not just copies. The exact same records: The Bon Jovi record with his first girlfriend's phone number scrawled on the front sleeve. The KISS Alive II he once shared with his little brother. The Replacements Let It Be he’s pretty sure, 20 years later, would still smell like weed. As he embarks on his hero's journey, he reminisces about the actual records, the music, and the people he listened to it with—old girlfriends, his high school pals, and, most poignantly, his father and his young son. He explores the magic of music and memory as he interweaves his adventures in record-culture with questions about our connection to our past, the possibility of ever recapturing it, and whether we would want to if we could. "Memories are far more indelible when married to the physical world, and Spitznagel proves the point in this vivid book. We love vinyl records because they combine the tactile, the visual, the seeable effects of age and care and carelessness. 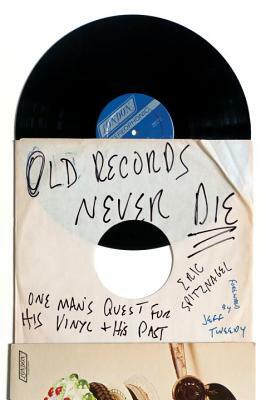 When he searches for the records he lost and sold, Spitznagel is trying to return to a tangible past, and he details that process with great sensitivity and impact." “I can't remember when a book had me get out my black pen and underline so many wonderful things. Maybe never. Loss and laughter and all those denizens of sonic ghost town record stores willing but often unable to make us all whole again. Something on every page to stoke the geek heart with sad recognition and hope." "Eric Spitznagel is just like Captain Ahab, if Ahab were chasing Billy Joel albums instead of a white whale. As he recounts in this very funny book, Spitznagel found way more than he bargained for. And just like Ahab, he dies in the end. (Spoiler alert.)"